Splash pages, you gotta love 'em. A blank canvas where the artist can hit you with a large dose of illustrated 'wow'. 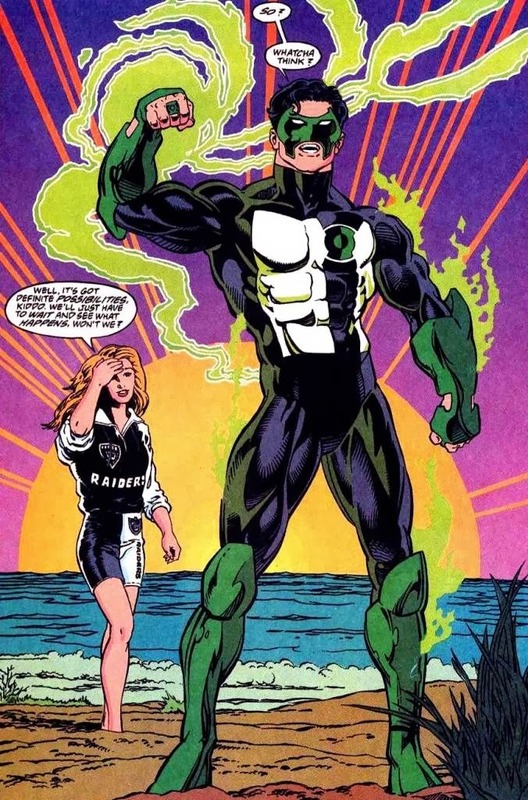 This week, as we turn the corner into 'Festive Season Land', a splashie by artist and co-creator Darryl Banks, of a Kyle Rayner who has just designed his own Green Lantern uniform. In true 90's style, he did it at the beach. Touching one of comics best costumes is a brave move for any artist, let alone Gil Kane's original GL designs, but when I saw this, I honestly thought, and still do, DC had done a great job. Kyle hasn't worn a better suit to this day. Like Robin becoming Nightwing, this was modern, fresh and showed a DC that wasn't afraid to move on and grow with its readers. Many great adventures, both in the JLA and Green Lantern franchises, plus the DCU in general, began right here. Never really got into Kyle - Im a big Jordan fan and the way DC dealt with him in order to facilitate this new character prob put me off him right at the get-go. And his treatment of Donna Troy, who depowered almost became a virtual accessory girlfriend who was messed about by him didn't help. COOL costume however, really sensational. Looks like proper armour. All the GLs should have costumes like this. For me Kyle, part of what made Kyle so great wasn't just the optimism and excitement he brought to being a GL, he also got rid of the yellow weakness and focussed the plot down onto one GL for a bit. Prior to Kyle the richness of what a interstellar police force offered, was was getting lost amongst unlimited members who due to a similarity in powers and costume made certain characters seem expendable right from the start. The Donna Troy treatment and infamous woman in a refrigerator didn't help, but seeing the DCU from Kyle's perspective really helped lead back into the 'wow' of the DC Universe in my books. And it gave us Fatality for which I'll always be grateful.